The jungle of various eCommerce shopping carts has grown very thick, and the competition between the solution has hardened. 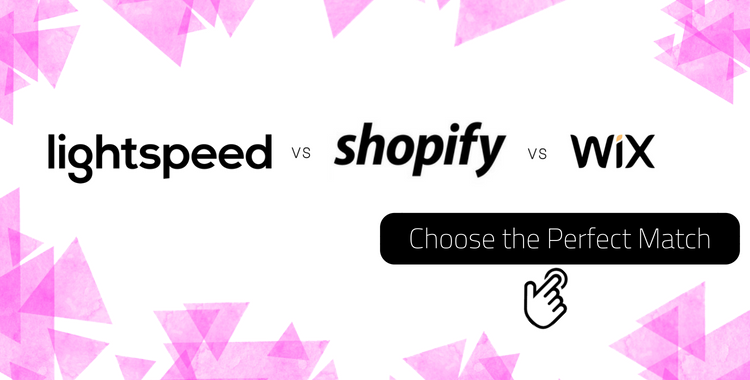 Therefore, shopping for the suitable platform to satisfy your business needs becomes more challenging, particularly when comparing the popular ones like Lightspeed vs Shopify vs Wix. Let’s outline the primary functionality choices and pricing options of these solutions to help you simplify the process of selecting the desired software for your organization. Depending on the business size, budget, requirements and objectives, the following platforms can help you boost sales and enhance the organization performance. inventory management that enables you to manage your inventory from one place. Product filters will facilitate searches within your e-store. Create product categories to help your customers easily browse the website, explore and purchase what they are searching for. Deal with returns within the platform, so your inventory is always accurate. Let your clients make their own return requests and have customers refunded directly with full or partial credit. platform’s design is represented by the customizable themes that let you create the e-store look without any technical skills. Get advantage of the intuitive navigation to let the shoppers search for products via dropdowns. Add some checkbox filter and set a price range search functionality. solution includes the built-in SEO tools to help your online store rank higher in search engines. Add meta descriptions to your products, optimize page headers, tag your products, etc. Benefit from blog capabilities like adding content to attract the customer and drive traffic to your website. solution’s subscriptions enableF you with the different functionality in terms of the inventory management. The Shopify Starter Plan includes some limitations to the maximum of 25 store entities. Yet, another plans provide you with a possibility to have the limitless amount of records to be added and sold via your e-shop. Since the solution a hosted shopping cart, you can skip the worries about website loading speed and server performance especially when the online store contains too many products. Also, take advantage of the Oberlo application for new users. Shopify takes the upper hand over other shopping cart in terms of the variety of free and paid customizable and mobile-responsive themes. The templates are pre-populated, so your task is to swap in your content and products to start selling right away. Even though some of the themes can be a little bit pricey, your company will benefit from them in the future. platform comprises more than 100 payment gateways that are divided into 3 sections: major, international, and additional payment gateways by country. Shopify has a significant edge over other software since the solution obtains its own payment processor. This simple-to-set-up capabilities let you manage the payments directly in the user dashboard. solution provides you with an opportunity to place SEO-optimized content that helps you become more visible and simply detected by the search engines. Get the SEO capabilities from the Wix’s marketplace, as well as explore a wide range of efficient capabilities to upgrade your account. shopping cart offers you a number of impressive templates that are available for free. Also, if you want to your creative ideas, select the blank template and create your unique design from scratch. regarding the customer support, you can check out WIX Help Center and find out the tutorials, videos and step-by-step guides on different topics. Besides, you can take part in Recent Discussions section that is designed as a forum. Reach the support team by phone or submit a ticket by email. By and large, the above-mentioned platform have their advantages, your task is to select the one that fits your business needs to boost sales and improve company processes. Take the information into consideration, make your choice and move your eCommerce data to the desired solution. Migration Insurance to run the import over if you decide to make some changes. Akin the stepping out of your comfort zone, choosing the perfect shopping cart between Lightspeed vs Shopify vs Wix and migrating to the future solution can be a difficult decision. Consider the hints and reasons above for transfering to your new platform, run the import and make your business stay competitive.